Brinsea TLC-50 Eco for better brooding of exotic birds. Altricial species of birds (including all parrots and birds of prey) are blind and helpless after they hatch and it’s some weeks before they may be able to move around, keep watch over their body temperature and feed themselves. Right through this era the young birds want to be kept in a clean, temperature controlled environment. The Brinsea TLC-50 Eco brooder provides digital keep watch over and read-out of temperature and fulfils these kind of functions very cost effectively and too can double as a Hospital Cage for in poor health or injured birds. With hygiene a top priority to your birds, the TLC-50 Eco has been carefully designed to make cleaning as easy as imaginable. The lower half of the cupboard and door are removable permitting them to be scrubbed and immersed. It is usually easy to wipe clean the high gloss finish of the ABS plastic upper cabinet and the fan guard is simply detached to permit get right of entry to to wash the fan. Even the heater is encased in a metal tube making cleaning easy. The keep watch over circuit is housed away from the chamber for reliability. Airflow within the TLC-50 Eco and has been carefully optimized to make sure consistent distribution of heat, so that every one chicks are on the same temperature but with the fan maintaining gentle airspeeds in order that down and dust aren’t blown around. 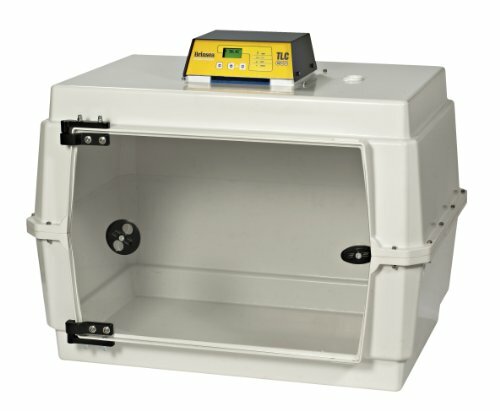 Like all Brinsea products the TLC-50 Eco brooder/Intensive care unit comes with a full 2 year warranty.